Linda Barth and Hazel Mitchell have teamed as author/illustrator for a new book about the charms and fascinating facts about New Jersey, our third state. 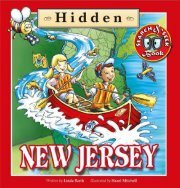 The book, titled HIDDEN NEW JERSEY, is published by Charlesbridge/Mackinac Island Press and is handsomely written and illustrated. It is available in both hardback and paperback so I hope you’ll look it up and add it to your library. Kids will enjoy the lively pictures, rhyming narrative, and cleverly presented facts. There are plenty of “hidden” pictures throughout the book, the kind that keep young readers involved. Linda, who is a retired fourth-grade teacher now substituting at Adamsville School, Bridgewater Township, New Jersey, reports that the Barnes & Noble store in the Somerset Shopping Center, Bridgewater, will hold a Book Fair to help introduce the book and a percent of sales that day will go to her school. The event will feature children’s art, teacher book readings, a presentation and signings by Linda, and much more. The date of the event will be announced soon. For further information, you can contact Linda at barths@att.net . And Hazel, the ever-so-clever artist, has created a neat trailer. http://hazelmitchell.blogspot.com/2012/01/how-to-make-book-trailer.html . Hazel was originally from Yorkshire, England and now lives and works as an writer/illustrator in Maine.